A four-five mile circular walk taking around two hours…allowing plenty of time to take in the spectacular views. This post is the first in our summer series on the South West Coast Path, coming soon later this summer. Golden Cap… it sounds like a cigarette brand from the 1940s or a new summer ale from a local microbrewery. It’s a hill. In fact it’s the highest hill or peak on Britain’s southern coast. It can be found just east of Charmouth, the fossil capital for Britain. 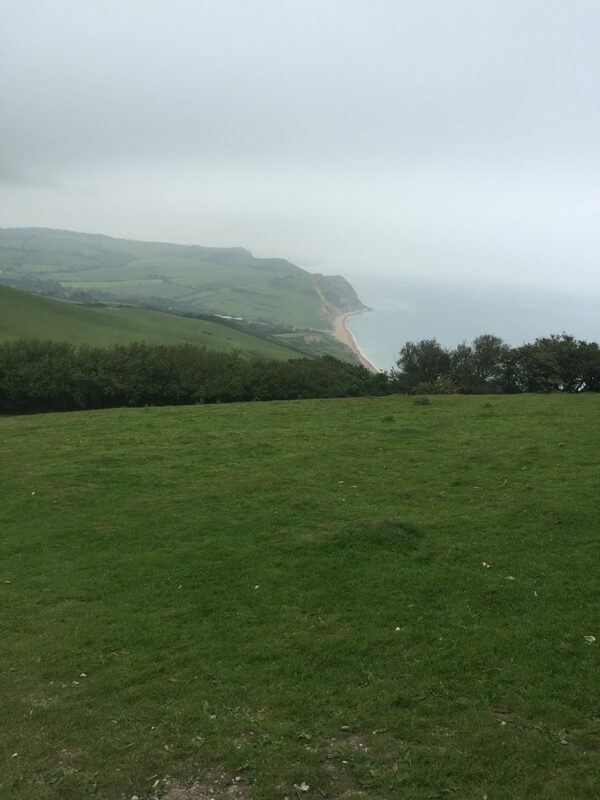 In fact Golden Cap crowns a series of steep hills along the spectacular Jurassic coastline that stretches across the East Devon and Dorset coast from Exmouth eastwards to Swanage. To climb Golden Cap there’s no better place to start than Stonebarrow Hill, where an old radar station now serves as a National Trust hut and car park. Information, snacks and plenty of advice are on hand here to suggest various routes to Golden Cap. We took the longer circular route. 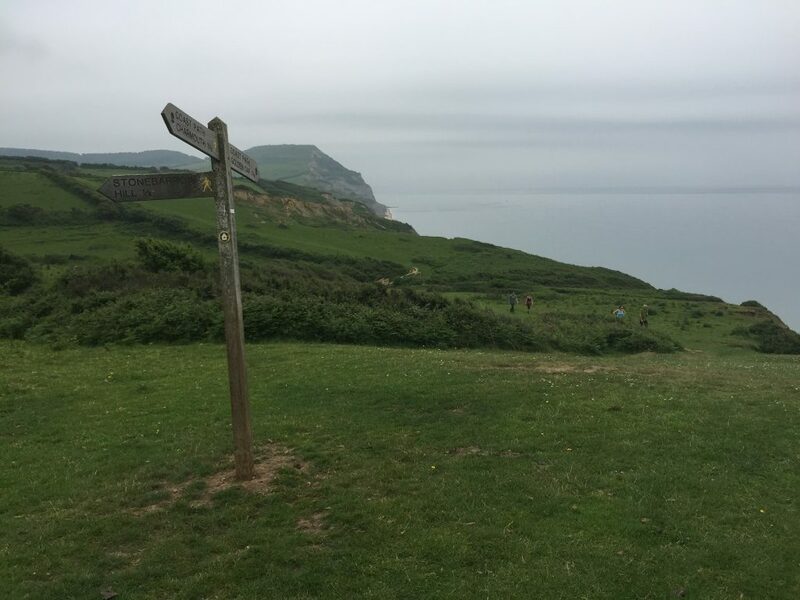 From the National Trust car park we turned right, as if heading back towards Charmouth, before swinging left and following a sign post for the South West Coastal Path. The path dips down the hill towards the coast past summer meadows. The path passes Westley Farm before the landscape opens up to a large expansive pastures that hug the cliff line. 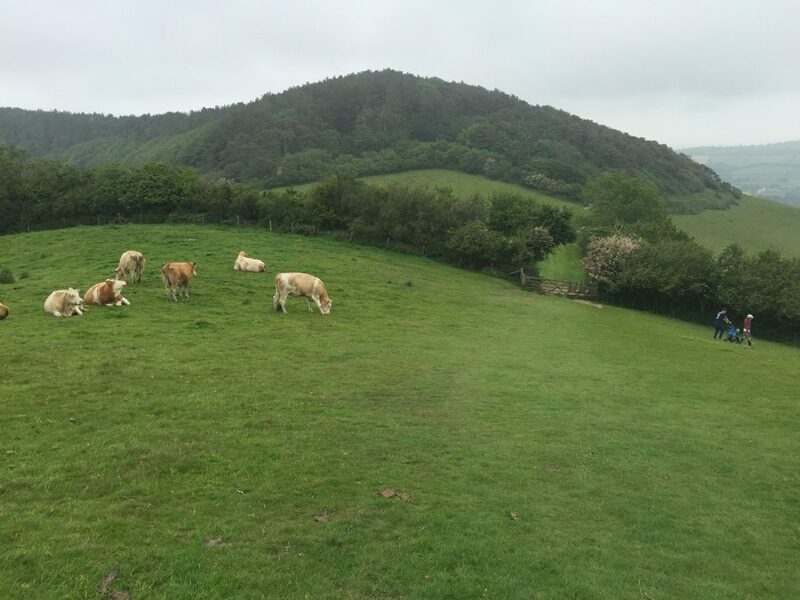 Golden Cap is clearly visible as you walk up and down over the rich, green pastures. Cattle roam free as you climb then descend over a series of smaller hills. 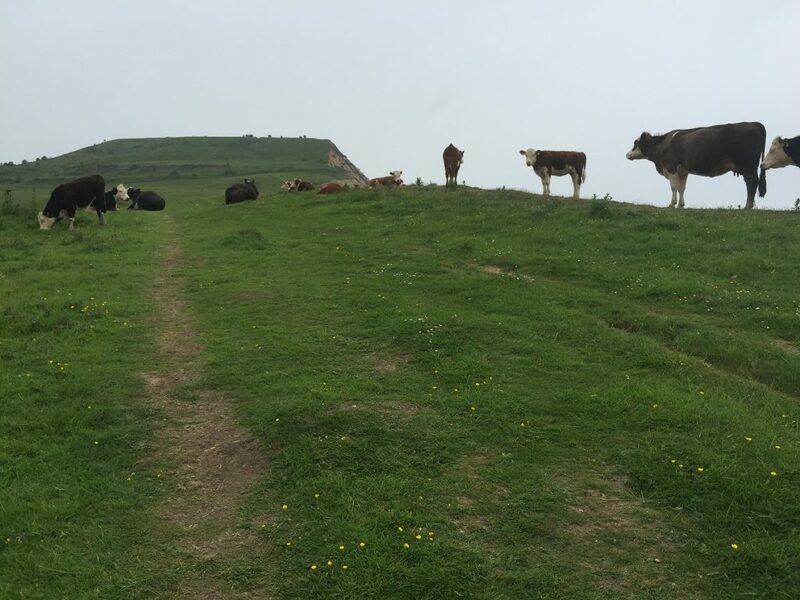 The path nips inwards near Broom Cliff and again descends before you climb Golden Cap itself. You brace yourself for a sharp ascent, as the path becomes stepped to help you conquer its steepness. But the climb is not too hard. Although it appears dramatic and dominates the landscape, Golden Cap is only 191 metres,. At the summit you have magnificent views. Westwards you see Lyme Regis, and below you, eastwards, is West Bay. From the summit we head inland and then swoop to our left heading back towards Stonebarrow Hill. We cross wide open meadows before picking up the quaintly named Muddyford Lane. You pass a thatched farmhouse which turns out to be the West Dorset National Trust office. Further along the lane you reach Pickaxe Cross. Here you head straight on along a stone made track. You swing right (inland) at Upcot Farm. The path veers left and then right as it climbs back up to Stonebarrow Hill. You reach a plateau and walk westwards along a wide stony track before returning to Stonebarrow Hill National Trust hut. You have gone full circle enjoying Golden Cap, expansive views of the coastline and the idyllic West Dorset hillside farmland…a very pleasant way to spend a couple of hours on a summer’s afternoon. 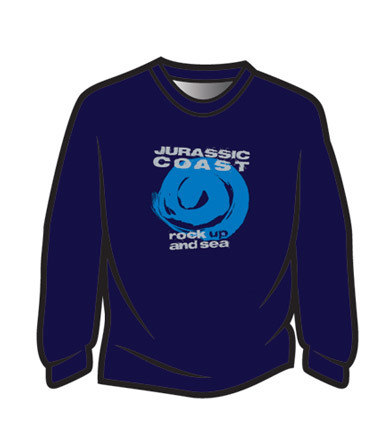 Exclusive Jurrassic Coast t shirts and hoodies are now available. Treat yourself…you know you want to! Our epic new South West Coast Path t shirts will also be available very soon.